Online Registration Form PDF | Available Now! AS OF 4/7/19 2019-2020 SCHEDULE IS UP! Hey Mrs. April! I just checked out your website and I just want to personally let you know how proud I am of you! You are truly inspiring trusting in God’s plan and following your heart and dreams. I think your studio will be hugely successful, but most of all i know you’ll make such a positive impact on another generation. You are awesome!! And a testament to that is your staff who is thrilled to get to work with you again! I hope i can attend recital. A dance studio is where your heart has always been. It's the gift God gave you, and I love that you honor Him by using it to bless so many! So as one of your former dance students, your lasting laughter and love lives on in me. I love you just as much today as I did then. You were made to dance I hope we read articles about you still dancing when you are 101!! So so excited for you April Storm-Hartsell the Lord has used you to shape so many children and their families over the years and I know there are many more you will touch. You teach so much more than dance you show God's love and it radiates. I am thrilled other families will get the blessing my girls and I got from you at dance so many years ago! Congratulations!! We had many wonderful years when our daughters were growing up with you as their dance teacher. To a new beginning! I loved having you as a dance teacher! :) I hope both of my daughters will dance at your studio one day! Good luck on your new adventure. This exciting news made me think of all the lovely young people you and dance have assisted through the years. Kerri and I chat about her time dancing with you quite often. The confidence and growth Kerri gained from dancing has been one of the most grounding beneficial parts of her childhood boosting her future forward. Best of luck to you. The kids of Grovetown are in for a life changing experience. April you taught me how to dance...and well...that IS your calling in life!! Not only because YOU are an amazing dancer but because of the passion and love that YOU put into it!! I can’t wait to see what unfolds and the beautiful dances you and the other choreographers will come up with. You have amazing teachers and I am so happy to know that you are doing this!! I miss dancing so much and can truly say because of YOU and what you taught me, I have been truly blessed!! Love you!! Need information that isn't on the website? Contact us at Support@artinmotion.studio or call 706.910.1155 during regular business hours.! Looking for a mountain retreat? Visit our cabin "ORION'S HEART" in beautiful Blue Ridge, Georgia, and click here to learn more about entering to win our three day/three night vacation raffle! 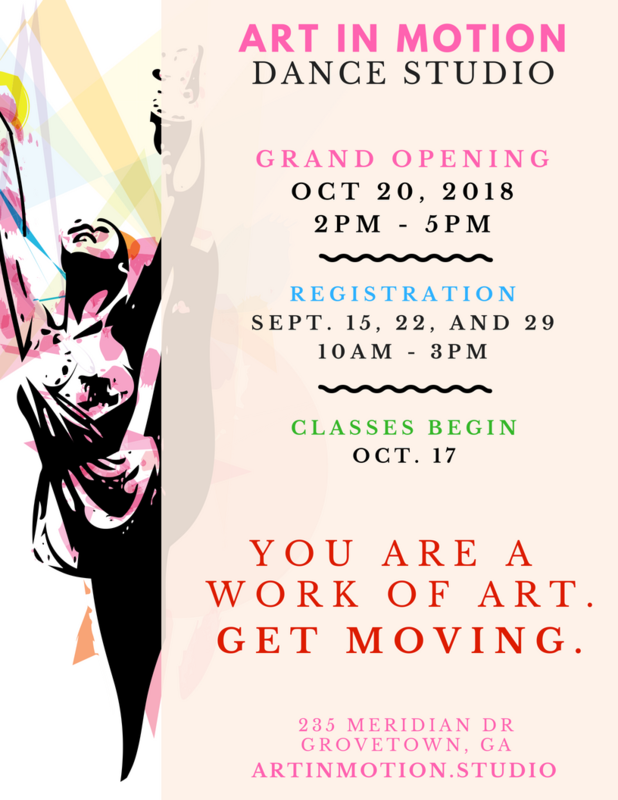 © Copyright Art In Motion Dance Studio, LLC 2018. All Rights Reserved.